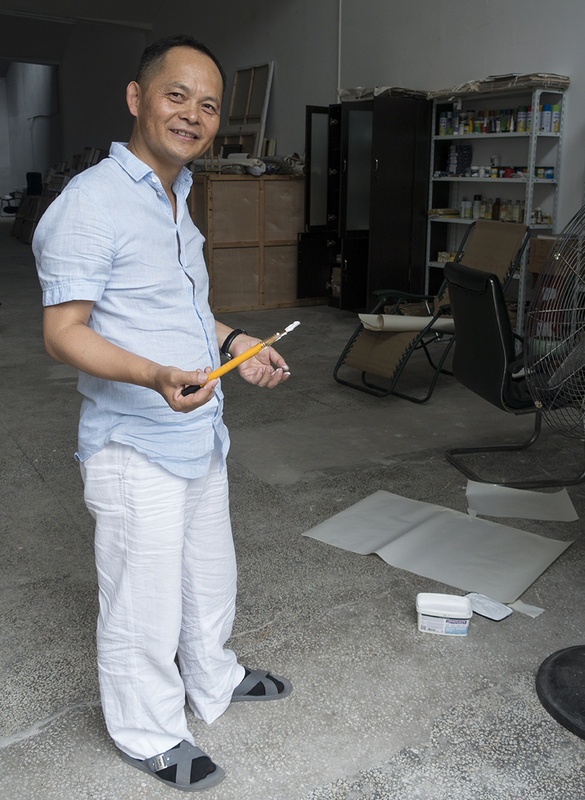 I’m in what was once an old warehouse in an industrial park in the northern district of Yangpu, a good distance from central Shanghai. This is the home of Jonas, his wife Nina and their daughter Anna. It is also here that Jonas has his showroom and workshop, Nina has her photo studio and where both of them have their office. It’s obvious that creativity is central in this home. 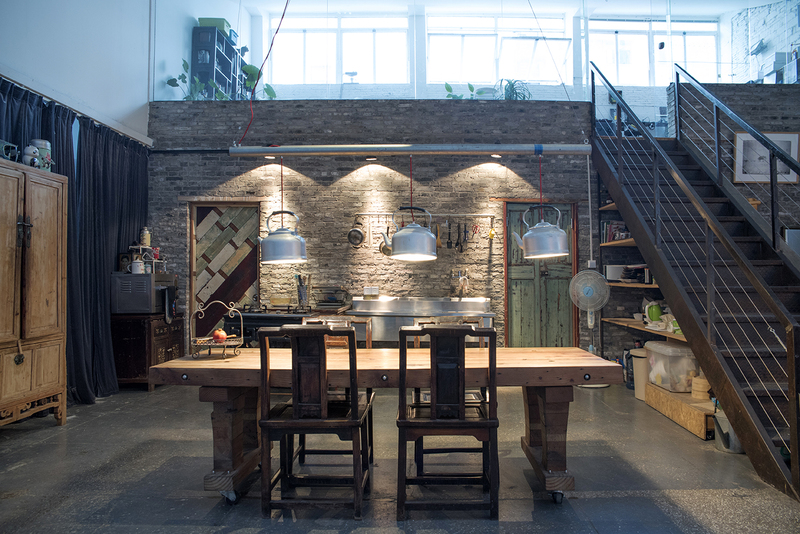 The industrial building in itself and the showroom that takes up most of the ground floor reinforces the feeling of it being more of a workplace than a home. But outside the entrance a collection of potted plants creates a homely feel in an otherwise industrial environment. The names Jonas + Nina + Anna painted on the huge rusty metal door, which is their front door, indicates that this is a home too. Entering their home I’m initially struck by the vastness of the space and then by the huge variety of objects placed around the large room, all of them made by Jonas. 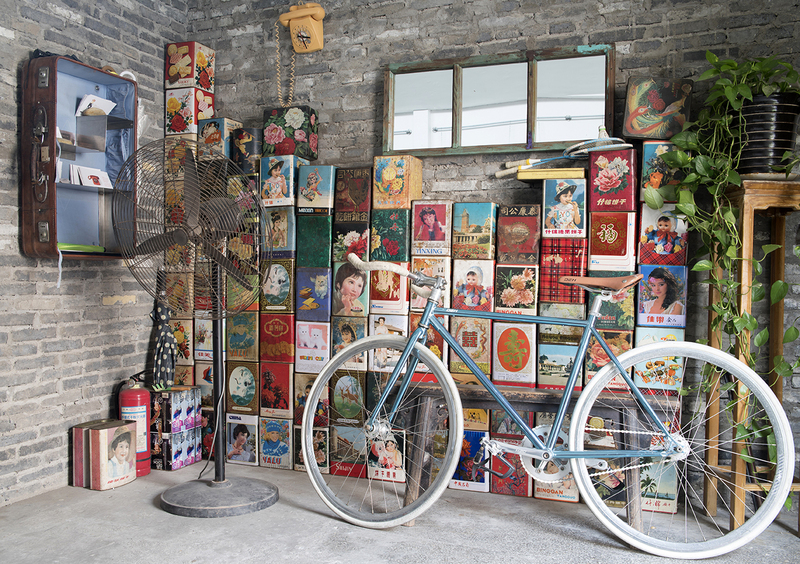 Directly inside the front door are colourful vintage biscuit boxes stacked against the wall, waiting to be turned into lamps. There is a kitchen area in one of the corners of the large room. Over the massive dining table, the light from three ceiling lamps made of kettles gives a cosy feeling. To the right of it is an old door leading into a bathroom and to the left is a door made of reclaimed wood that leads to a bedroom. Behind floor-to-ceiling drapes is Nina’s photo studio. Next to it, behind metal doors, is where Jonas has his workshop. The building was originally a single large room open to the roof. 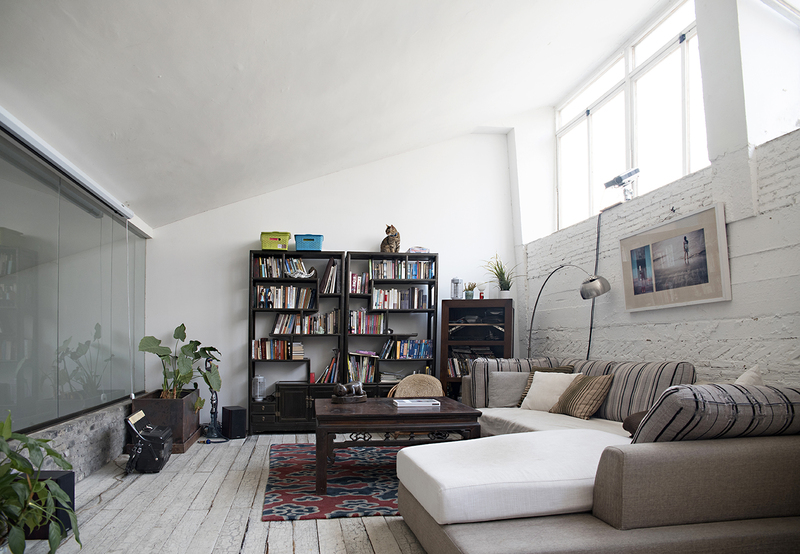 Jonas and Nina added a loft, where they have their living room as well as a bedroom for themselves and their daughter. This gives them the privacy of a home but they have an office space up here as well. When they found this place it was dilapidated and required a lot of work to turn it into what it is today. But they saw that this place would be ideal to both work and live in. However, it was necessary to get in help to do the extensive renovation work. They brought out the buildings original brickwork and repainted the interior of the large 300 square metres building. 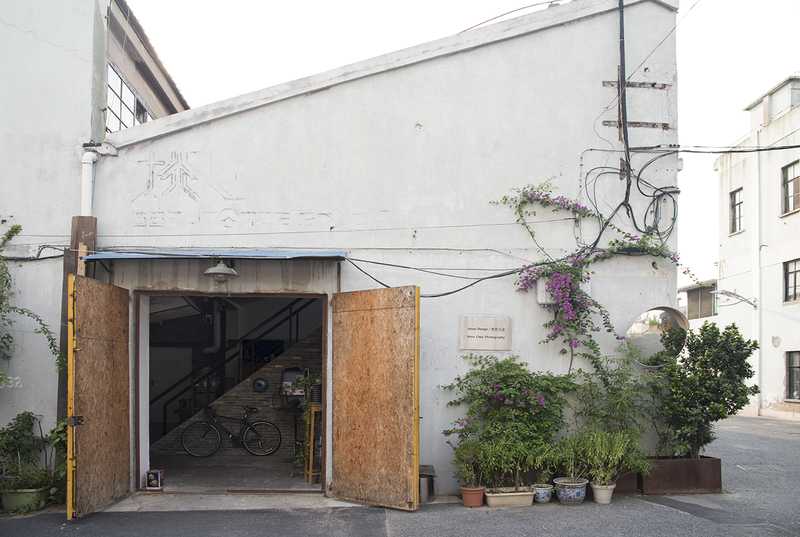 Wu Wei Creative Park where Jonas and Ninas lives was earlier mostly frequented by artists but is now more or less taken over by wedding photographers. On a daily basis one can see numerous photo shoots taking place. 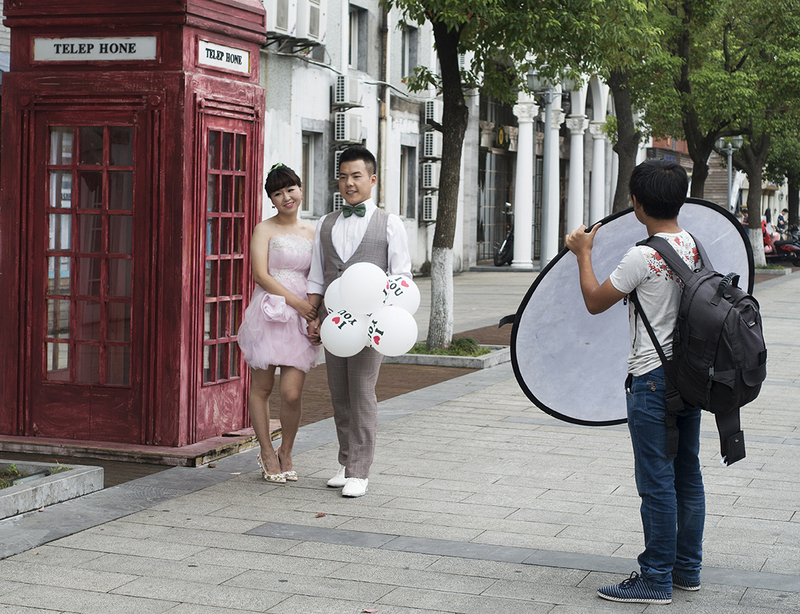 Wedding photography is apparently a huge business here. They have built fake storefronts in the streets such as a Hello Kitty store and check out the way the word Telephone is spelled on the “old English phone booth”. The whole thing is so cheesy that I was delighted to find a real artist at work in his studio a few doors down from the loft. We had no words to exchange but I hope he perceived how happy I was to have found him, and I hope that he is still there for many more years to come.